Multi-user allows you to create separate accounts for different users on your LG G Pad™ 7.0 LTE. Watch the steps to add and delete user accounts. An interactive map of the buttons and Home screen of your LG G Pad 7.0 LTE. Learn how to turn your LG G Pad 7.0 LTE on and off. Here's info on the battery specs (e.g., Usage Time, Standby Time, etc.) for your G Pad 7.0 LTE. Improve battery performance on your LG G Pad™ 7.0 LTE. Learn how to switch to Battery Saver mode to help conserve your LG G Pad 7.0 LTE. Learn to connect to other Bluetooth® enabled devices on your LG G Pad™ 7.0 LTE. Learn how to pair your LG G Pad 7.0 LTE with your Bluetooth device. Learn how to send photos to another Bluetooth device, like a tablet or printer, with your LG G Pad 7.0 LTE. Here's info on common camera settings (e.g., storage, timer, etc.) for your LG G Pad 7.0. Learn how to adjust the video setting for easy sharing in emails, social network posts and more on your LG G Pad 7.0 LTE. Learn how to take a picture of the screen and view it on your LG G Pad 7.0 LTE. A visual guide for changing scene modes to take a picture with both cameras at the same time on your LG G Pad 7.0 LTE. Learn how to record a video using your LG G Pad 7.0 LTE. A visual guide to set a picture as the Home screen background on your LG G Pad 7.0 LTE. A visual guide for sharing photos by email, social networks and more using your LG G Pad 7.0 LTE. A visual guide to sharing a video with another person or device using your LG G Pad 7.0 LTE. Learn how to take a picture using your LG G Pad 7.0 LTE. Learn how to take a picture while recording a video on your LG G Pad 7.0 LTE. An interactive guide on how to take a selfie with your LG G Pad 7.0 LTE. Learn how to zoom in and out for video recording on your LG G Pad 7.0 LTE. Learn how to zoom in and out for taking photos on your LG G Pad 7.0 LTE. Learn how to add a new contact to your LG G Pad 7.0 LTE. Discover how to add or delete contacts from your Favorites list on your LG G Pad 7.0 LTE. Discover how to assign a picture to a contact on your LG G Pad 7.0 LTE. Discover how to assign a ringtone to a contact on your LG G Pad 7.0 LTE. Learn how to create a group of contacts on your LG G Pad 7.0 LTE. Learn how to share the information for one of your contacts with someone else using your LG G Pad 7.0 LTE. Learn where to find the SIM card and tablet numbers for your LG G Pad™ 7.0 LTE. Learn how to access settings on your LG G Pad 7.0 LTE for actions such as changing alert sounds or turning off GPS services. A visual guide for saving battery life on your LG G Pad 7.0 LTE by adjusting the screen timeout. A visual guide for muting your LG G Pad 7.0 LTE. An interactive guide for setting your LG G Pad 7.0 LTE to Airplane mode. Learn how to forward an email on your LG G Pad 7.0 LTE. Learn how to add an attachment, like a document or photo, to an email with your LG G Pad 7.0 LTE. A visual guide for replying to an email on your LG G Pad 7.0 LTE. A step-by-step visual guide for sending an email using your LG G Pad 7.0 LTE. Learn how to send an email to a group on your LG G Pad 7.0 LTE. Learn how to access your work email on your LG G Pad 7.0 LTE. Discover how to access your existing email account on your LG G Pad 7.0 LTE. Learn how to access different email accounts on your LG G Pad 7.0 LTE. An interactive guide on how to add folders to the Home screen on your LG G Pad 7.0 LTE to help organize your apps. An interactive guide on how to place widgets and apps on the Home screen of your LG G Pad 7.0 LTE for quick access to them. A visual guide for adding and deleting Home screens on your LG G Pad 7.0 LTE. An interactive guide on how to rearrange and resize widgets and apps on the Home screen of your LG G Pad 7.0 LTE. An interactive guide on how to remove widgets and apps from the Home screen of your LG G Pad 7.0 LTE. Use Mobile Hotspot on your LG G Pad™ 7.0 LTE. An interactive guide for setting up your LG G Pad 7.0 LTE as a Mobile Hotspot so you can share your data connection with other devices. Browse the web on your LG G Pad™ 7.0 LTE. Learn how to bookmark a website on your LG G Pad 7.0 LTE so it's easy to find later. Discover how to find a website using your LG G Pad 7.0 LTE. Discover how to search the web using your voice with your LG G Pad 7.0 LTE. A visual walkthrough of opening, closing and switching between windows or tabs in the web browser of your LG G Pad 7.0 LTE. An interactive guide for changing the language settings on your LG G Pad 7.0 LTE. A visual guide for setting screen security on your LG G Pad 7.0 LTE to help protect your private information. Learn how to unlock the screen on your LG G Pad 7.0 LTE. Discover how to insert a microSD card into your LG G Pad 7.0 LTE to add more memory for things like photos, videos, music and documents. Learn how to remove a microSD card from your LG G Pad 7.0 LTE. An interactive guide on how to easily find, open and close apps that are running on your LG G Pad 7.0 LTE. A visual guide for swiping between multiple Home screens on your LG G Pad 7.0 LTE. Discover how to access and clear the Notification Panel on your LG G Pad 7.0 LTE. Discover how to insert a micro SIM card into your LG G Pad 7.0 LTE. Learn how to remove a micro SIM card from your LG G Pad 7.0 LTE. Discover how to access your Facebook account on your LG G Pad 7.0 LTE. Learn how to log out of Facebook on your LG G Pad 7.0 LTE to help protect your account. A visual walkthrough on how to update your Facebook status and post photos using your LG G Pad 7.0 LTE. Learn how to record a text message from your LG G Pad 7.0 LTE. Discover how to send a text message to a group of your contacts from your LG G Pad 7.0 LTE. Learn how to use Q Pair to receive call and message notifications from your phone on your LG G Pad™ 7.0 LTE. 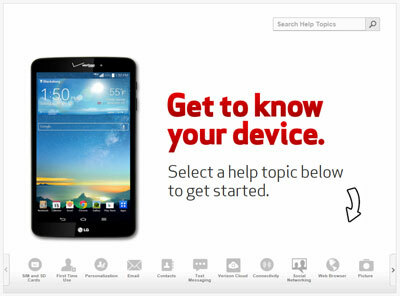 Discover how to find more help with using your LG G Pad 7.0 LTE through videos and tutorials. Discover how to change the background of the Home screen on your LG G Pad 7.0 LTE. Use Wi-Fi Direct to easily connect via Wi-Fi to other devices on your LG G Pad™ 7.0 LTE. Learn to set up Wi-Fi on your LG G Pad™ 7.0 LTE. Learn how to Use your LG G Pad 7.0 LTE to connect to a Wi-Fi network so you can access the Internet without using data.